My mum once told me one of the things she really liked about reading fiction was learning something new. Not just in terms of historical fiction, but in any fiction when the author lets slip insights about a place or a hobby or even something you just didn’t realise existed. The Sword of Kuromori is not only an Alex Rider-style highly visual adventure with pace and passion and wit, but also a subtle lesson in Japanese language and culture. Teen Kenny Blackwood arrives in Tokyo expecting to spend some time during the school holidays with his father, who is residing there. However, even on the plane to Japan some peculiar events occur, and when he is taken aside at the airport and interrogated, things get even stranger. Before long he finds out that he can see mythical creatures that other people can’t, and that he’s been secretly signed up to a life-changing mission that will save America from catastrophic tragedy. Jason Rohan’s knowledge of Japan sings from the pages of the book. He paints each scene so vividly, be it the expansive transport terminals, the lush landscapes and temples, or the colourful shopping areas – each setting is pitched so that the reader feels they know Japan despite not having been themselves. Moreover, the action never stops – Kenny seems to attract the attention of more than one type of mythical monster, all of which are strikingly hostile, and he has to use his wits and skills to bat them off. He is accompanied on his adventure by a feisty and attractive female sidekick – who becomes more and more central to his journey. She happily reminded me of Bixa from Phoenix by S F Said. 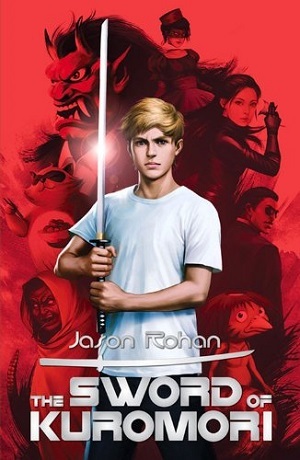 With strong allusions to other tales of masters and apprentices, from The Karate Kid to Star Wars – this book resonated with me by being familiar and yet totally unfamiliar at the same time; familiar in tone to other adventures of self-discovery and awareness, yet unfamiliar with its Japanese language and mythology. The mixture produces the perfect package. And despite the many monsters, this is also a grounded tale of family and friendship, of good versus evil and our ability to master our minds and conquer our fears. I was particularly glad of the glossary of Japanese words at the back, the subliminal teaching of Japanese numerals, and being immersed in the food and culture of another region. 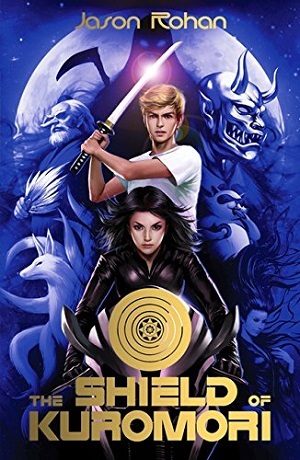 I’m moving swiftly on to reading the just published book two, The Shield of Kuromori. A highly recommended read. For age 9+. You can buy both books here or on the Amazon sidebar.